Union Station building glows at night in the busy downtown Toronto, Ontario, Canada. In busy downtown Toronto, Union Station's architecture glows from the evening lights. The towering columns and the archway of Union Station are displayed by the lights. Cars drive by leaving their headlights streaked in the street. The CN Tower and high rise buildings stands towering in the distance. 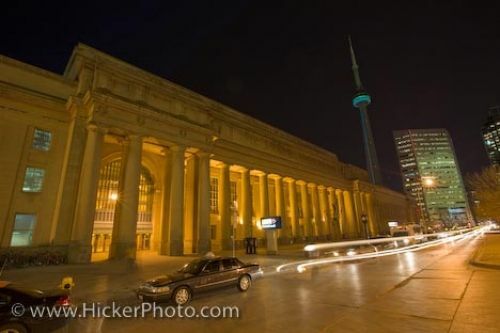 Union Station in downtown Toronto at night, Ontario, Canada. Evening lights glow on the beautiful architecture of Toronto's Union Station.